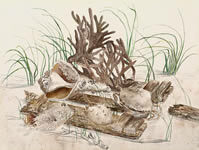 Welcome to MyWatercolors.com! 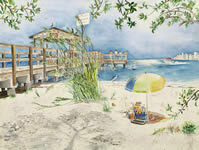 All decorative paintings displayed here are original watercolor paintings created and copyrighted by Florida watercolor artist Carol Crawford. 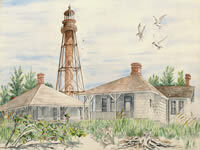 Carol specializes in Florida light house paintings (specifically the Sanibel light house), beach paintings, landscape paintings, still life paintings, Florida manatee paintings, ocean paintings and other tropical art scenes. 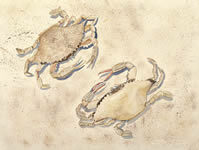 Reprints of her decorative paintings are high quality Giclée prints with exceptional color accuracy. 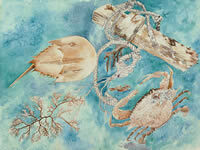 You can now purchase prints of Carol's watercolor paintings easily and instantly -- online! All full size prints are printed using archival inks and archival watercolor paper for high quality art you'll be proud to display! Prints are mailed in an un-rolled foam core for protection during shipment. Shipping charges will be calculated automatically when you order. 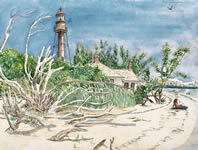 Many of Carol's light house paintings, beach paintings, landscape paintings and tropical still life paintings are available in print. 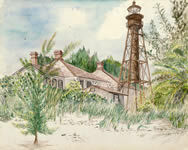 Some of Carol's original watercolor paintings are also available. If you have any questions please contact us! 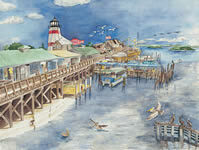 Carol Crawford is available for commission watercolor paintings -- especially yacht paintings, house and buildings (business or residential) and scenic landscape paintings. 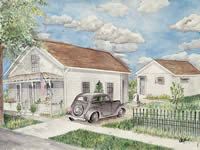 Carol prefers to paint subjects in person but can easily work from photographs, new or old. Custom matting and framing is also available. 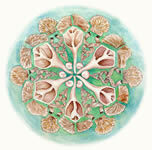 Carol also is an experienced mural painter with past subjects including tropical landscapes, children's themes and more. Paper: 16 1/2" x 11 1/2"
Image: 20 1/2" x 13 1/2"
Paper: 11 1/2" x 16 1/2"
Image: 13 1/2" x 20 1/2"
Image: 9 1/2" x 12 5/8"
Paper: 10 1/2" x 13 3/4"
"Grandma's House" is an example of Carol's custom commission work. If you are interested in commissioning Carol for a custom piece of work, please contact her. Rates vary depending on your request. Image: 9 1/2" x 11 7/8"
Paper: 11 1/2" x 13 7/8"
Image: 15" x 18 3/4"
Paper: 17 1/2" x 21 1/4"
CUSTOM ARTWORK AND/OR FRAMING AND MATTING! My husband, Bob, was my strongest supporter. He was so proud of my work and encouraged me to take it from being a hobby to a business - to make my paintings into giclée prints for others to enjoy. His favorites were the realistic landscapes. He was planning to help with the marketing of my website and artwork, unfortunately, a month after I entered my first art show (Fall of 2002) he became ill with pancreatic cancer. He bravely endured surgery and chemo, but this terrible and deadly disease claimed his life on August 30, 2003. In his honor I will donate 10% of all profits from my artwork to PanCan, the Pancreatic Cancer Action Network. He was a wonderful man who cared so much about others. If you would like to learn more about his life and our family please visit our memorial website to him at RobertHCrawford.com. Website Design by Bentwood Productions, Inc.